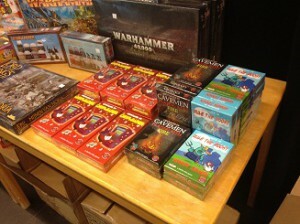 September 26, 2012 – The games have arrived! We are very happy to announce that after a long journey the very first three Odynaut Games titles arrived safe and sound in the Netherlands. The first load of games have been delivered to stores in the Netherlands and Belgium. So the games can be purchased! On the Dutch language version of the website you can find all the retail points in the Netherlands and Belgium. The Odynauts are ready to play Chipleader, Rule the Roost or Cavemen Playing with fire, so they dare you: let the games begin!